Background It can be argued that Kenzo Tange’s Tokyo Bay project in 1960 is the last major piece of planning in Japan led exclusively by an encompassing architectural vision. The ambitions and scope of the Tokyo Bay project were necessarily large and comprehensive, ranging from the macro to the micro: from the effects of planning down to the specific architectural character (style) of the project itself. As such, it encompassed the full environmental, social, political, and aesthetic possibilities of which architecture is capable. Such a vision is utopian in the best sense of the word. The project embodies not a flight of fancy but rather a radical empiricist desire to project, in eminently concrete terms, a possible world. Today, Tokyo has a new set of urban challenges requiring a new set of solutions—these problems still deal with a lack of space, but are also accompanied by reduced densities, pollution, and an ongoing energy crisis. Landfill capacity is close to exhaustion due to space constraints and over four million tons of household waste is dumped into Tokyo Bay each year. Although the government has adopted a pro-incineration policy for decades, this has led to greater environmental problems. With over 2000 municipal incinerators, Tokyo is the current global leader in dioxin release, recently being cited as the producer of 40% of the world’s output. A new vision is needed for the future of Tokyo— one that can come much closer to Japan’s legacy of environmental respect and responsibility by using the ambitions of the Tokyo Bay project as a departure point for new speculations on the future of the city. Linear City Within this new set of urban problems, the issue of the large public infrastructural project comes into question. The project site, the Kawasaki Artificial Platform and the Tokyo Bay Aqualine, is a bridge-tunnel combination across Tokyo Bay. It contains the world’s longest vehicular tunnel and was built at a cost of $11.2 billion. The Aqualine is a hybrid structure composed of a 4.4 km bridge and 9.6 km tunnel underneath the bay. At the bridge-tunnel crossover point, there is an artificial island with a rest area consisting of restaurants, shops and amusement facilities. In the middle of the tunnel, a tower uses the bay’s almost-constant winds as a power source to supply air to the interior. Since the nineteenth century, infrastructure has been overtly utilized as a model resulting in the amplification of systems of movement, distribution, and control. While the proliferation of these systems has necessarily been attendant to modernization, they are rarely questioned or seen as anything other than discrete components of a hierarchy no greater than its parts, circulatory systems for nodal aggregations of culture. The potential of designing new transportation technologies lies in the wider implications and effects of the system. The implementation of high-speed rail technologies creates a spectrum of possibilities and effects ranging from the global to the local, from the level of regional planning and development to the local structures that such technologies carry forward and promulgate. STUDIO BRIEF Contrary to a more limited view which would understand the introduction of high-volume/ high-speed arteries as merely being able to provide a faster connection between point A and point B, these technologies will have unprecedented effects on urban and ex-urban development. 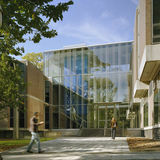 The studio task is to develop new flexibility strategies, both locally and globally. These necessarily would link large-scale, top-down strategies with small-scale, bottom-up models of development. It is a supersystem containing many subsystems. In this context, the local is never merely local, but rather a coherent part of a greater whole. For a system to be truly flexible and adaptive it must arrive out of a logic of feedback between the general and the specific and viceversa. This methodology fundamentally develops infrastructural logics that allow for the playing out of a certain range of possible urban outcomes. Built into this model is the capacity to handle change over time, as opposed to more traditional planning strategies which only provide fixed templates for limited sets of desires. This new Linear City must move past the ideological stance of Metabolism (pure expansion) to more contemporary concerns of intelligent urban growth combined with sustainability or environmental necessities, such as power generation, refuse treatment, desalinization, bioremediation, urban regreening, or restoration of ecological habitats. Zaera-polo: Rather than thinking of buildings as objects, the Princeton Envelope Group is interested in seeing buildings as “things” in the sense that they are attached to a much wider set of processes, or controversies. The envelope is the limit between public and private, inside and outside; these are limiting these milieus but at the same time they draw these attachments to them. What we are going to address today is the set of tools that enable architects to draw these attachments to the envelopes as “things,” points of convergence of different processes and points of debate and discussion between different forces and milieus. Allen: Alejandro’s argument is double: on the one hand, he calls into question the naïve assumption that architects can make political boundaries disappear simply by wishing them away. He reminds us that the politics of the boundary and the architecture of the boundary never perfectly coincide. But it’s also a reassertion of a very specific aspect of architectural expertise: the suggestion here is that if architects are expert at anything, they are experts at limits and boundaries. Latour: Networks have made the notion of the impenetrability of anything disputable. Networks allow redistribution of actions that were self-contained before and distribute their attributes around. When we are talking about the envelope we are not at all talking about a set of contained entities. On the contrary, we are talking about something that has largely been redistributed throughout different types of entities. Sassen: How do we make the envelope more sustainable? Can we use the complexity of the city? What would it mean to bridge it with the multiple ecologies of nature? Rather than doing remediation and recycling, to really try to use all of the variety, all of those complexities, and then connect them with the multi-scalar capabilities of nature. The notion for me is bridging. Not reducing to some sort of common denominator where we can go at it with a concerted effort. No. Multiplying the bridges, re-deploying and opening up. Above: Alejandro Zaera-Polo; left: Jeff Koons; below: lecture notes, “Global Technologies,” Marc Simmons; bottom: Sylvia Lavin, surprise guest Frank Gehry, Jeff Koons, and Liz Diller. van berkel: I believe that is important to use the envelope as an apparatus, as a tool, whereby we can use it as instrumental for the way we can produce an architecture. Maybe in that sense, I wish I could go much deeper into the term apparatus.... Maybe the apparatus is the best description of the way we have approached the idea of the surface and spatial organization. Koons: The envelope is about power. It’s about wanting to exercise power and at the same time it’s about giving up power. The envelope is about serving or being served. It’s about control—having control and giving up control. Keynote speaker Christopher O. Ward, Executive Director of the Port Authority of New York and New Jersey. Partial prototype of concept car design— Axel Kilian, Peter Schmitt, Patrik Kuenzler, Enrique Garcia, MIT Media Lab 2005. Christian Zapatka, model, Asplund Villa Snellman exercise, 1986. Faculty jury in a graduate studio directed by Charles Gwathmey, New York City, 1968. Faculty: Michael Wurmfeld, Kenneth Frampton, Michael Graves, Charles Gwathmey; students: Chris Chimera, Russell Swanson, Michael Sena. the dramatic change from a nationalistic to a transnational globalized perspective, and from a city built after the end of colonization to a city flourishing in our current age of postcolonial critique. The highlight of the seminar was travelling to Chandigarh this spring to see the works in person, interview some of the living protagonists and to gather archival material on site. With Vikram Prakash, Professor at the University of Washington, a native of Chandigarh, and son of one of Le Corbusier’s project managers, the class was able to not only study the Capital Complex designed by Le Corbusier, but also the progressive housing projects of Jane Drew and Maxwell Fry, the public infrastructure of Pierre Jeanneret, and the urban plan developed by Corb and Albert Mayer. In the next months Esther, Beatriz and some of the students will continue to collaborate on an ongoing discussion about Chandigarh’s urban and architectural legacy as part of a Media and Modernity project. Esther da Costa-Meyer (left); Professor Vikram Prakash (far right), University of Washington— Seattle, son of Aditya Prakash who worked with Le Corbusier in Chandigarh; and S.D. Sharma (second from right), who worked with Le Corbusier and Jeanneret in Chandigarh; with local students. 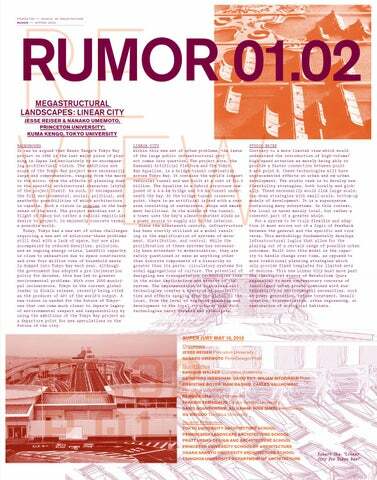 RUMOR is a new Princeton School of Architecture newsletter. RUMOR appears three times a year with news and reviews of the many activities at the School of Architecture: studios, classes and reviews; lectures events, conferences and faculty updates. RUMOR is by definition fragmentary and incomplete: a quick snapshot of the life of the School, telegraphic and immediate. From left: (front row) Kevin Hayes, Phoebe Springstubb, Beatriz Colomina, Esther da Costa-Meyer, Sam StewartHalevy; (in the opening) Osnat Tadmor, Federica Vannucchi, Matthew Clarke; (back row) Tamicka Marcy, Christina Papadimitriou, Marc Britz, Vanessa Grossman. Photos: V.Ragunath, architect/photographer. (continued from p.06) opening a challenge to the limitations of ‘form’ and ‘space’. The article situated this challenge in the problem of decorum, and in the reciprocity between the body of the building and Merleau-Ponty’s corporeal scheme. Asplund’s villa was not imported whole, but was trimmed of its more blatantly vernacular aspects. For example, Asplund’s foreground one-storey wing was replaced with a garage in the same place as that of Le Corbusier’s Villa Stein-et-Monzie at Garches (incidentally creating a garage endowed with a fireplace). Moreover, the original idea was that the villa be disposed on a suburban plot somewhere west of Princeton, shaded by Maxfield Parrish trees (including a deciduous version of the tree before the facade of Garches) and furnished with an opulent driveway obeying American turning-radii. Accordingly, the students were presented with an extraordinarily ambiguous object. From their point of view, the American predilection for European iconography could refer back via Swedish vernacular Classicism to the northern European Romanticism of, say, Schinkel or Weinbrenner. Equally, it was possible to imagine this latent Garches as the seed of a fully modernist configuration. Lurking between these alternatives was an Emilian farmhouse as depicted by Morandi. Most prominently, the adaptation retained the original villa’s play between the supple body of the building and the slightly estranged windows and ornament which paradoxically gave great authority to the exterior walls and turned them into paper. Similarly, the interior order seemed poised between a return to poché and an anticipation of Corbusian fragments. In its isolation, the building managed to be both proud and humble, opulent and austere, sober and witty, bearingwall and balloon-frame, an anticipation of modernism and the last thump of falling masonry from ancient Rome. More pittura metafisica than Venturi, the curious building compelled the students to ask fundamental questions. Aldo Rossi’s version of typology, evidently communicating directly with several centuries of architectural treatises, subsequently appeared to clarify such ambiguities. However, Rossi’s inspiration for both Graves and the E.T.H. suggests a victory for the ambiguities. If Graves’ Villa Snellman exercise deserves credit in the history-books for its prescience, the enduring lesson is the attunement to decorum, as the motive which cuts through the logomachy and the references, orienting interpretation about the wit and dignity of dwelling. —After completing his undergraduate degree at Princeton in 1968, Peter Carl received a Master of Architecture from the School in 1973 and the Rome Prize the following year. He is currently Professor of Architecture at London Metropolitan University.